The Staple Up (Open Ridge) method is the standard method used most often in WARM or HOT climates for wide open attics. This is especially true if your main objective is to reduce summer heat gain, or if you have ductwork in the attic. For COLD or MIXED climates, you should lay the AtticFoil™ directly over the existing insulation using the Over the Insulation Method. For the standard staple up method, the radiant barrier foil is stapled horizontally (from left to right) across the bottom of the rafters, starting at the bottom and working your way up. You want to cover as much as you can as fast as you can, which is why the horizontal application is suggested. You do not have to run the foil horizontally, since the direction has no effect on the performance. Click to download printable install instructions. Click here for Spanish version. Have a tall attic or high ridge? Consider the Flat Top Installation Method. The main benefits of choosing the Staple Up Method are that it: provides a cooler attic space, allows for storage on the attic floor, keeps air handlers, duct work, etc. in a cooler environment for better efficiency, and it does not interfere with insulation placement on the attic floor. Below is a quick video, going over the highlights of a standard staple up method for installing AtticFoil™ radiant barrier. The following 3 videos will take you through the complete installation from start to finish. 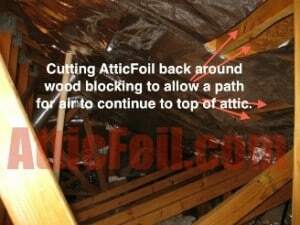 Following are more detailed instructions on how to staple up AtticFoil™ in a standard open attic space. Using either a measuring tape or just counting, count the rafters in your attic space along one slope of the roof; rafters are usually 24″ or 2 feet apart. Count them and add about a foot to your final number to make sure you don’t run short. Cut pieces outside the attic. The best way is to cut several pieces at a time and work in sections. The driveway works well. Use a standard utility knife and have some extra blades handy. Don’t use scissors, they will quickly get dull. Use a cardboard box as a cutting board. If you plan ahead, you can cut 5-10 pieces at a time and minimize trips into the attic. This is a perfect job for a helper to do. Tip: Take the ends of your cut pieces of the AtticFoil™ and pull them together, then fold or roll up the foil. When you are in the attic, you and your helper can each grab an end and pull it out full length. 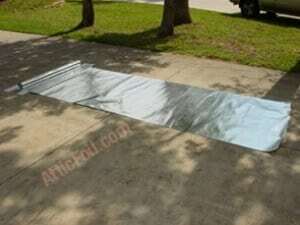 This method will keep the foil from getting folded up or wrinkled. Most installs go best when you start at the bottom with larger pieces and work your way up toward the top of the space. This enables the first piece to be pulled across and level. Use a helper and pull the first piece across the space, leaving a small gap (3-6″) at the bottom. You can start the foil all the way at the bottom of the rafters, but if you do this, make sure you have open soffit vents in the section to provide intake attic ventilation. If you have no soffit vents (or a lack of soffit vents in this area), you need to leave a gap at the bottom. Continue moving up with your next piece of foil. It does not have to be pretty; if you get the foil between the roof and the attic insulation, the foil will work correctly. Seams can be overlapped, butted against each other or leave a small gap between pieces. Remember, you are using perforated foil; therefore, the installation will not be airtight. You do not need to tape the seams – it will not have any effect on the foil performance but it is handy for patching up cuts and gaps. You can purchase the foil air conditioning tape at a local hardware store for about $7 to $8 and it can come in handy when you are trying to patch up areas that you have cut around to make the install look pretty. Keep in mind the tape is not meant to create an air-tight installation, because that is not the goal. The goal is to allow air to move as it normally would, so the tape is simply an option to make the install look prettier. Either cut around bracing and other obstacles, or just go over them. The foil does not have to be perfectly smooth. You can use a foil air-conditioning tape to patch foil back together after cutting, but you do not have to do this. When cutting around objects, don’t worry if it is not a tight fit – a few gaps are OK. Tip: Use a pen/marker to mark a common distance on the rafters (about 52″ up from the floor joists) to help guide your first run of foil. This helps the foil stay level, prevents uneven stapling that could result in crooked runs or useless overage on one end of the attic and it ensures about a 4″ gap at the bottom of the install for air flow. Keep in mind that good attic ventilation is important because keeping air moving through an attic not only keeps the air temperature cooler in the attic, but it also helps to remove moisture. Just like we mentioned in the section above, you want to install the foil so there is a gap at the bottom and a gap at the top of the attic. Regardless of the type of ventilation systems you have, this is the best way to do it. When done this way, fresh outside air will enter the attic low at the soffit level and it will go one of two routes: either up the channel created by the foil (between the roof deck and the foil) or it will come into the attic below the foil. As hot air accumulates, it will move toward the top of the attic, just like water in a bathtub migrates toward the open drain. The hot air will find its way out your exhaust vents (whether that is a ridge vent, gable vents, powered fans, etc.) and allowing the air to easily flow throughout the attic promotes a cooler attic air temperature as well as maximum potential for reducing moisture. The main thing is to allow the air to flow as freely as possible, while still maintaining a good coverage. There is not an exact science as to how large the gaps need to be, just make enough so the air has a path to escape out and leave the attic. The simple way to look at this is: air should flow though the attic as though the foil is not even there. For more information on gaps and airflow see: How much of a gap should I leave at the tops and the bottoms of the foil to allow for proper ventilation? Sometimes the foil and the attic framing supports don’t line up perfectly. You can either cut a strip and staple below the support. Or, you could go OVER the TOP of the support and encapsulate it in foil and connect to the bottom piece of foil. You might have what is called “blocking” between your rafters. These are cross-supports to add strength to your roof. The blocking will also constrict airflow behind the foil. You have two options: 1) let the foil “droop” an inch or two below the area with blocking to allow air to bypass or go around the blocking. 2) Cut around the blocking to allow air to exit/enter. Either way works. All you need is to do is create a path to keep the air moving to the top of the attic. Continue to work your way up to the ridge. STOP the foil about 3-6″ from the ridge. This gap will allow a pathway for air to “pool” in the top of the attic. The hot air will then exit the attic through either your ridge vents, wind turbines, electric or solar fans or static vents. Homeowners really tend to get too concerned about this. It’s OK if your “holes” in the attic are not at the highest part of the roof at the ridge. Just think of the air like water and it is “draining” out the top. Cut holes in the radiant barrier below ALL exhaust vents about 6″ larger then the actual vent holes. It is important to create a pathway for cool air to come in the bottom of the attic and heated air to go out the top of the attic. With normal ventilation foil will ONLY increase shingle temperatures 2º-10º which is acceptable and will not damage or shorten the life of your roof. For more information on how foil effects the life of your roof and shingles, read our page: Radiant Barrier and Roof Temperatures. Roof Hips and Valleys should be treated like any other part of the roof. Remember, you want to create a path for air to flow behind the foil and then up and out. On hips and valleys this is done by simply cutting a hole or slit at the top and the bottom of each cavity. Air will naturally be drawn in the bottom and out the top. Ultimately all hot air will end up in the top of the attic and be exhausted by whatever exhaust vents you have. Remember, you want air (attic ventilation) to continue to flow through the attic as though the radiant barrier foil is not even there. A slot is left along the ridge, on any hips or valleys, and around roof vents to allow air to flow from the soffits to the top of the attic and then vent out the top of the attic. The holes (demonstrated in the photo to the right) are small, about the size of an adult hand. Gables are the “flat” ends of the attic – Run the foil across the framing. Leave a small space at top and bottom of gable ends. You want air to be able to flow behind the foil. You want outside air to still enter the bottom of the attic and vent out the top exhaust vents. It does not matter if you have ridge vents, wind turbines, gable vents, fans or other vents the hot air will find the top of the attic. You DO NOT have to have ridge vents for radiant barrier to work. Want to Add More Insulation Later? 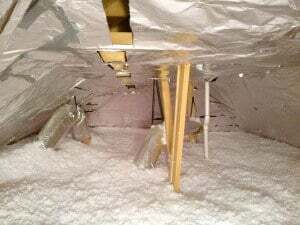 If you want to add insulation to your attic floor at a later time or right after you install the AtticFoil™, then you should consider using these two methods to do this: the skirt method and the slit method. These methods take the place of using traditional baffle vents in the rafter cavities and are equally effective at maintaining airflow. The Skirt method create a skirt, or overhang of foil. This method should ONLY be used if you have adequate soffit vents in the area where the skirt method is used. The skirt method is good if you plan on adding additional insulation later. It will act as “back stop” to keep the insulation from blowing into the soffits. The RED line shows how the foil is folded back. The Slit method is when the first piece of foil goes as far down as possible. This first piece will keep insulation from falling down into the soffit. Then, leave a small slit/space/gap 1-2″ between the lowest piece of AtticFoil™ and the second piece. Ideally, you want air to enter behind the foil from the soffits. 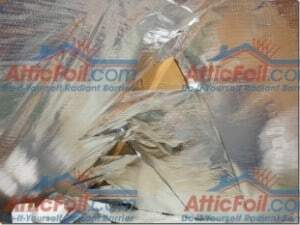 This “slit” method will allow attic air to enter behind the radiant barrier foil and help with good attic ventilation. If you already have baffle vents in the attic and are wondering how you can work with them, you can just use the Slit Method and make your slits/cuts so they are right at the top of the baffles (this should end up being about 48″ up the rafter ends from the attic floor). The cuts at the top will allow air that is coming in from the baffles to enter the main attic space while some will stay between the foil and the roof deck. Air movement like this is ideal and it will keep air flow uninterrupted. It’s also possible that the top of the baffles will line up perfectly with the top of your first (horizontal) run of foil – if so, that’s perfect! Just start your second run a few inches above the top of the baffles and you’ll create the gap needed for airflow without going back to cut the foil. As you reach the peak, remember to leave your gap at the top, regardless of whether or not you have a ridge vent. Remember, good attic ventilation is important because keeping air moving through an attic not only keeps the air temperature cooler in the attic, but it also helps to remove moisture. For more information about the myth that Radiant Barrier Causes Moisture click here. Once you’ve finished the large open areas, then you can go back and attempt to cover any smaller or hard-to-reach places in the attic that you skipped over. Keep in mind that you don’t have to cover every square inch of the attic for the foil to work, AtticFoil™ has a cumulative effect, meaning partial coverage works too! Take a look at our DIY Project Gallery to browse photos and case studies submitted by our customers all over the USA. 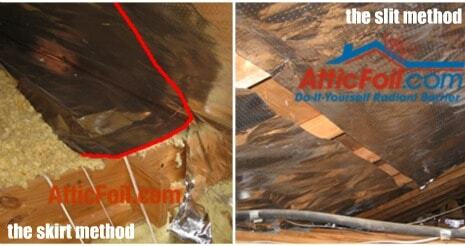 A little preparation and planning ahead is all you need to install AtticFoil™ in your attic. For more tips on doing this project yourself, take a look at Ed’s top two tips for installing radiant barrier below.